Jacksonville, Florida - Avril Lavigne topped a McAfee study of the most dangerous celebrities to search for online. Have you ever wondered who the most dangerous celebrities on the internet are? No? Me neither! But apparently, someone does because on Tuesday, McAfee released its 11th annual Most Dangerous Celebrities study. What does that mean? Well, in the interest of Science!, McAfee does a yearly study of which celebrities yield the most dangerous search results. The intent of the study is to illustrate how easy it is to click a bad link and get malware. 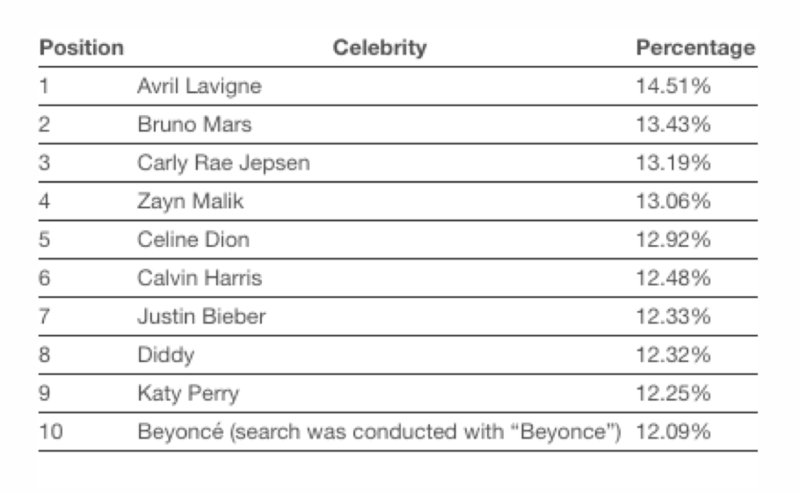 Using its proprietary technology, McAfee conducted a number of searches combining celebrity names and high-risk search terms, then created a risk percentage by dividing the number of risky websites with the total number of results returned. Who is the Most Dangerous Celebrity on the Internet? Avril Lavigne is the most dangerous celebrity on the internet according to the McAfee Most Dangerous Celebrities 2017 study. This is likely on account of her announcing a new album due out in 2017, as well as an internet conspiracy that says the real Lavigne died and was replaced by an impostor. Lavigne takes over for Amy Schumer, who was the most dangerous celebrity in 2016. Whereas in past years the list has been a combination of actors, musicians, and other celebrities, 2017’s list is entirely comprised of musicians. The highest ranking actor was Anna Kendrick at 13. The results are likely skewed by the methodology – something McAfee cops to in its report – searching the celebrity’s name along with “free mp4” or “free mp3” is obviously going to yield a greater number of musical results. In fact, Anna Kendrick is probably the most dangerous celebrity on account of having a chart-topping single from the movie Pitch Perfect. That hypothesis is further bolstered by the presence of Jennifer Lopez and Will Smith as two of the next three most dangerous actors on the list. McAfee provides some additional advice on how to search safely in the form of four tips. Two of the four are, understandably, pitches for McAfee products and services. But, strip out the branding and it’s still good advice. First, you should definitely have some type of protection installed on your browser. McAfee sells an after-market product called Web Advisor. Personally, I’m not familiar with it, but I will say that Google Safe Browsing and Microsoft SmartScreen are both excellent security filters that already come pre-installed on most browsers. Use them. Heed their advice. They’ve been designed to keep you safe from precisely these kinds of threats. McAfee also pitches a comprehensive security solution for your computer like its Total Protection product, which combines its browser filter with anti-virus and other security features. Again, regardless of whether you go with McAfee, Symantec, Comodo or another vendor, this is good advice. Beyond that, McAfee just offers some common sense advice. While yes, it is actually possible to download leaked albums, that usually involves the use of chat clients, bots and other, more complicated, machinations. Either way, you’re not going to find it hosted on a website for download. This is for myriad reasons, but it’s just not going to happen. What you will find is malware advertised as a leaked album hosted on a website. Just use common sense. Does it really seem like that new album you’ve been waiting for would just be sitting here on this random, spammy-looking web page? No? Good call. And then, of course, there’s the very basic advice that just searching for the term “mp3” is dangerous. And adding the word “free” to the mix just increases the risk.